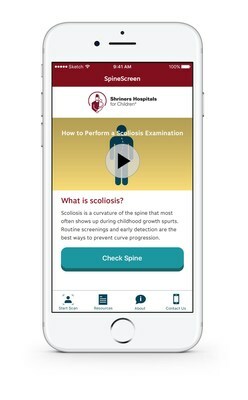 TAMPA, Fla., Aug. 15, 2017 /PRNewswire/ -- Parents can now check their child's spine for possible signs of scoliosis with the new app SpineScreen developed by Shriners Hospitals for Children®. Available for free on the App Store and Google Play, SpineScreen detects curves as the cell phone is moved along a child's back, giving parents a quick, informal way to regularly monitor their child's spine. Scoliosis is an abnormal curvature of the spine that can restrict movement and in some cases lead to other serious medical conditions. It is most commonly diagnosed between 10 and 15 years of age, when children grow rapidly. Some cases, however, can go undetected. At this point in a child's life, fewer vaccinations are required, so they may see a doctor less often. Since early detection is crucial, Shriners Hospitals physicians encourage parents to download the free SpineScreen app and check kids as part of their back-to-school routine each year. "Because there is often no known cause, monitoring for scoliosis is an important part of a child's ongoing health care," says Amer Samdani, M.D., chief of surgery for Shriners Hospitals for Children — Philadelphia. He adds, "It is a progressive condition, so early detection is key. At Shriners Hospitals, our care ranges from routine monitoring to some of the most advanced treatments for scoliosis. The earlier we see a child, the more options we have available." Shriners Hospitals created the app as part of a broader initiative to highlight the importance of regular screenings and to educate parents on the signs of scoliosis and treatment options. "With doctors and staff who are global leaders in the treatment of scoliosis care, parents turn to Shriners Hospitals for Children because they know their children will receive the best care possible," Gary Bergenske, chairman of the Board of Directors for Shriners Hospitals for Children. "Since scoliosis usually requires ongoing medical treatment throughout childhood, our commitment to provide care regardless of the families' ability to pay is a huge relief to parents." If you have immediate concerns about your child's spine or other possible medical conditions, please consult your health care provider. For more information on scoliosis screenings, treatment options and to download the SpineScreen app, please visit shrinershospitalsforchildren.org/scoliosis. Shriners Hospitals for Children is changing lives every day through innovative pediatric specialty care, world-class research and outstanding medical education. Our 22 locations in the United States, Canada and Mexico, provide advanced care for children with orthopaedic conditions, burns, spinal cord injuries, and cleft lip and palate. Learn more at shrinershospitalsforchildren.org.